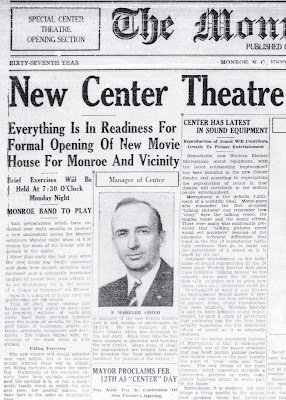 Partial of front page on 2-8-1940 of The Monroe Enquirer, Monroe, NC for opening of The Center Theatre. Microfilm copy of newspaper available at the Union County Public Library, Monroe, NC. F. Wheeler Smith was the former owner & operator of The State Theatre, which burned in 1939 about a block north of his new Center. "Soft" opening of theatre on Feb. 9th with formal opening set for Feb. 12th (1940).